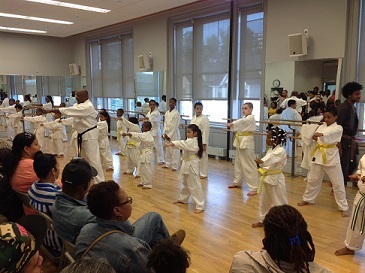 The Martial Arts Program at Mind-Builders features Goju Ryu Karate for students ages 5-18. The program is designed to help students develop the necessary skills to enhance their lives through the discipline and challenges of martial arts training. Classes are offered for beginners and more advanced students, and are designed to allow students to safely advance to whatever level they wish to achieve in martial arts. Our program leader, Master Thomas Bennett, holds black belt ranks in USA, Japanese, and Okinawan Goju karate. He has been studying and teaching karate for over 45 years. While developing an American style Reality Ryu, he has trained students at all levels, including preparing students for national and international martial arts competitions.